Cue sports (also known as billiard sports) were first played in 15th century Europe. English poet and writer Charles Cotton is best known for his nonfiction works, The Compleat Gamester (1674) and The Compleat Angler (1676), the former considered the standard English-language reference work for gambling games, including billiards. 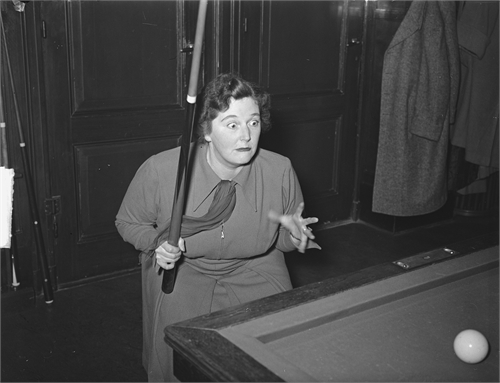 While pool remains the most recognized subdivision of cue sports in North America, carom billiards (a French styled cue sport played on billiard tables without pockets), snooker, and Russian Pyramid (English and Russian styled games played on snooker tables with six pockets) demonstrate the truly international appeal of the sport. Billiards has had an enduring impact on many societies since its inception. Mary, Queen of Scots was wrapped in her billiard table cover after her beheading. Shakespeare’s tragic Antony and Cleopatra famously references the sport as Cleopatra frantically exclaims “Let’s to billiards” in Act II, almost in a state of distemperment. Early American presidents George Washington, Abraham Lincoln, and Theodore Roosevelt, all headstrong political leaders, were enthusiasts of the game. Actor Jackie Gleason, who famously portrayed Minnesota Fats in the screen production of Tevis’ The Hustler, was also a proponent of the sport. Martin Scorsese’s award-winning film, The Color of Money (1986), featured Paul Newman as an aging pool hustler and his cocky apprentice played by Tom Cruise. That movie was also based on Tevis’ novel. World Public Library offers an array of great references for many cue sports. F.M. Hotine’s Modern Billiards provides rules and regulations for an assortment of billiard games; Billiards Simplified: Or, How to Make Breaks offers gameplay illustrations; and J.P. Buchanan’s Hints on Billiards offers excellent technical insight.